Returning to his childhood home for a funeral, a middle-aged man is drawn to the farm down the road where his childhood friend lived. Memories came flooding back that he hadn't thought of in years, of remarkable and terrible events that occurred when he was just a small boy. It began when a lodger staying at his house stole the family car and used it to commit suicide. Then a governess came to stay, and though his family was completely seduced by her, the boy found her terrifying. As events escalated, he turned to the Hempstock family down the lane for help. I don't want to say too much about the story here because it is magical and fantastical, and those are the sorts of stories that come out sounding ridiculous when you try to summarize them. 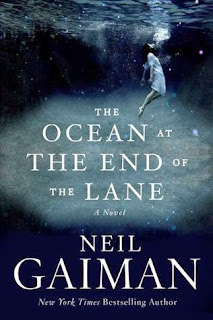 Nail Gaiman's writing is lovely, so reading this imaginative story was a pleasure. On the sentence level, he's pretty perfect. His visual imagery is powerful, his dialogue just quirky enough. There's nothing I can criticize about the story, either. It's a pretty solid little fantasy novel. I can definitely appreciate Neil Gaiman's books (I've also read Coraline and The Graveyard Book), but I don't really get super into them the way other people seem to. It may just be that I can never quite believe something so fantastical, but then again I loved the Harry Potter series, so I don't know what to make of that. The Ocean at the End of the Lane is very short, under 200 pages, and even though it didn't totally grab me, it was absolutely worth the enjoyable hours I spent reading it. This was how I felt about the book also. But if you want to understand the mania, you have to read Neverwhere and American Gods.